It is not like going to the bank. And no Kleenexes on the counter. There is no refund if someone forgets to wish you a good day. No list of local hotels with a negotiated rate. No one wants to know if you are a doctor. Plastic is not magic. 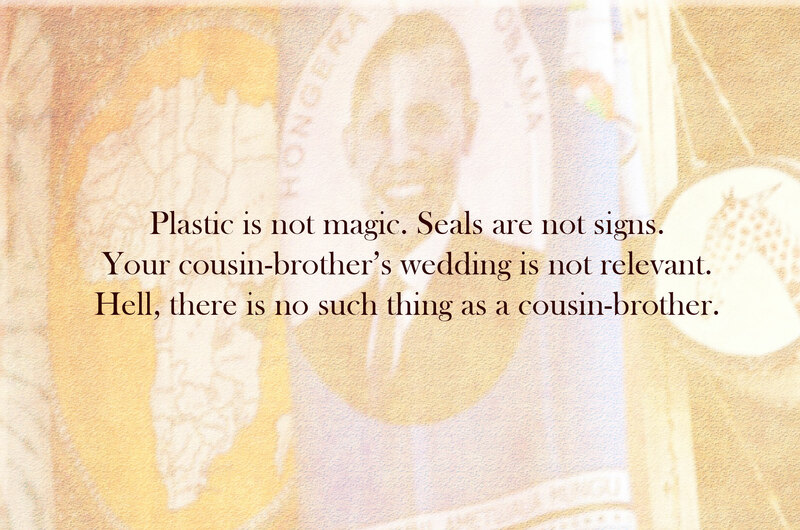 Seals are not signs. Your cousin-brother’s wedding is not relevant. Hell, there is no such thing as a cousin-brother. Tsitsi Jaji is a Zimbabwean American, and grew up in Harare before moving to the U.S. for college. Her first poetry chapbook, Carnaval is included in the collection Seven New Generation African Poets and she was awarded an honorable mention in 2015 for the Ron Sillerman Prize. Her poetry has appeared in Prairie Schooner, Madison Review, Black Renaissance Noire, Bitter Oleander, Illuminations, ElevenEleven, Poetry International’s Zimbabwe page, and the Center for Book Arts Broadside Poetry Series. She is also the author of a scholarly book, Africa in Stereo: Music, Modernism and pan-African Solidarity (Oxford UP, 2014). She teaches at Duke University.